Silicon Valley-based startup, Light has plans to unveil a foldable smartphone with nine lenses at the end of this year. The startup is also a maker of 16-lens camera that came last year. Now the same technology is being planned to be incorporated into a smartphone. Dual-lens phones or triple-lens cameras are quite common but seems like Light will be taking the competition to the next level with nine lenses. Either it will up the camera’s game or it will be an overkill. The startup showed some concept and working prototype handsets to the Washington Post recently. The prototype handsets had five to nine lenses built into the back. 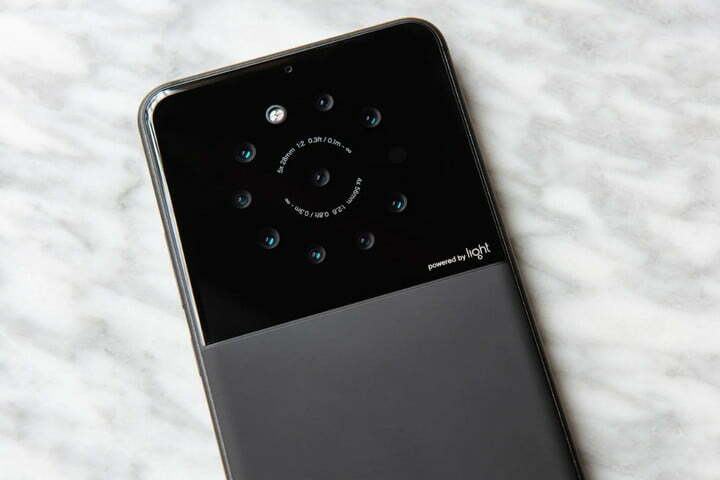 According to the company, their smartphone camera will be offering exceptional low-light performance and diverse depth effects while shooting images up to 64 megapixels. This might be a dream come true for all selfie fanatics and aspiring photographers. This poses one challenge to the users of this smartphone; this will create storage issues on the phone as photos usually occupy a lot of storage. If users choose to store photos on Cloud, it will consume a lot of their time and might be costly for them. Light’s unique camera technology makes use of multiple camera lenses that possess different focal lengths in order to capture multiple images it a time. After capturing, it uses algorithms for fusing them together in order to create a picture. Earlier, we reported that Microsoft might be bringing foldable phones that offer support of upto five positions, including a position where both ends of the screen are facing each other, i.e. total inversion. As smartphone manufacturers are offering advanced camera technology on their phones, so in order to be successful, Light needs to make sure its camera and design are truly exceptional.